The kids put up a fight against the huge all-star players formerly in the NFL. 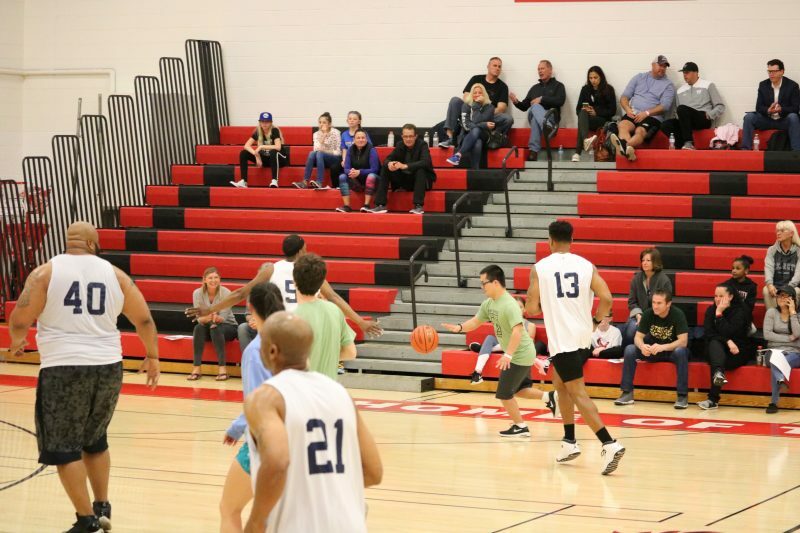 Lonnie Allgood’s Dreams for Kids Inc. foundation and the Ocean City Education Foundation teamed up for an unforgettable night of fun and laughter in a variety of games pitting former NFL players against Ocean City All-Stars. The Ocean City All-Stars were comprised of six different teams that each took on the NFL players for a 10-minute period. Dreams for Kids is a nonprofit whose mission is to help build children’s character by giving them the tools they need to believe in themselves and respect others. A large part of their mission is interaction with current and former professional athletes as mentors and inspiration. The roster for the NFL All-Stars included former players of the New York Jets, Denver Broncos and Indianapolis Colts – Kareem Huggins, J’vonne Parker, Chad Plummer, Aaron Beasley and Michael Campbell. Included in the all-stars was also former NBA player Horace Jenkins of the Detroit Pistons. Master of ceremonies Lonnie Allgood addresses the crowd. First up to take on the all-stars was Ocean City High School’s Best Buddies Club. They dominated the first 10 minutes of play, holding the NFL players scoreless with stifling defense and great shots at the basket. Next up was the Ocean City Teachers. Members of the school district put on a clinic for the NFL stars. There was a bit of trash talk happening between the former pros and the teachers, but the teachers came out victorious, hitting a big three-pointer to end the period. Picking up where the teachers left off, next out was the team from the Ocean City Intermediate School. Not always known for their basketball prowess, the NFL all-stars were outmatched by the agile footwork of the youngsters from the Intermediate School. 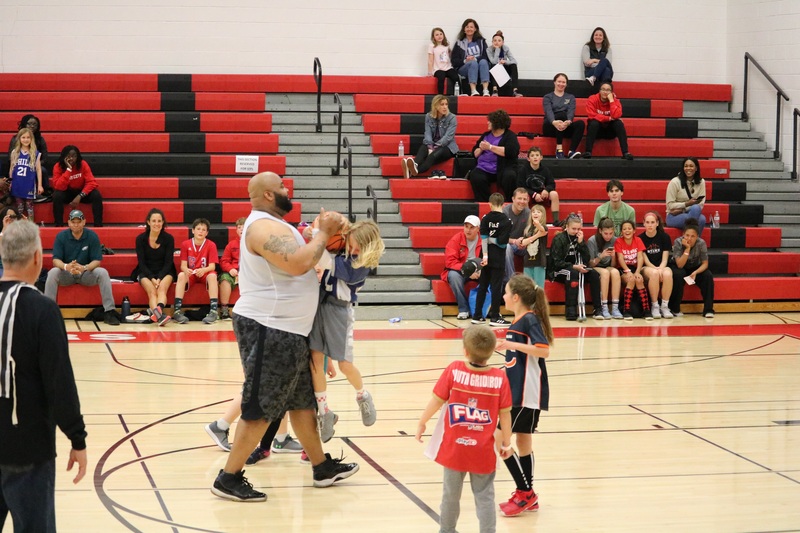 Stepping their game up a notch, the former pros had no problem using their size advantage to even up the score against the local youth flag football team in game four. Not one to shy away from a challenge, the flag football playing phenoms used sheer numbers to force turnovers and tie the game up with two games left. City Council President Pete Madden, right, defends against the all-stars. After wearing the big men down with youthful speed and energy, it was time for the “professionals” to step in and handle business against the NFL pros. 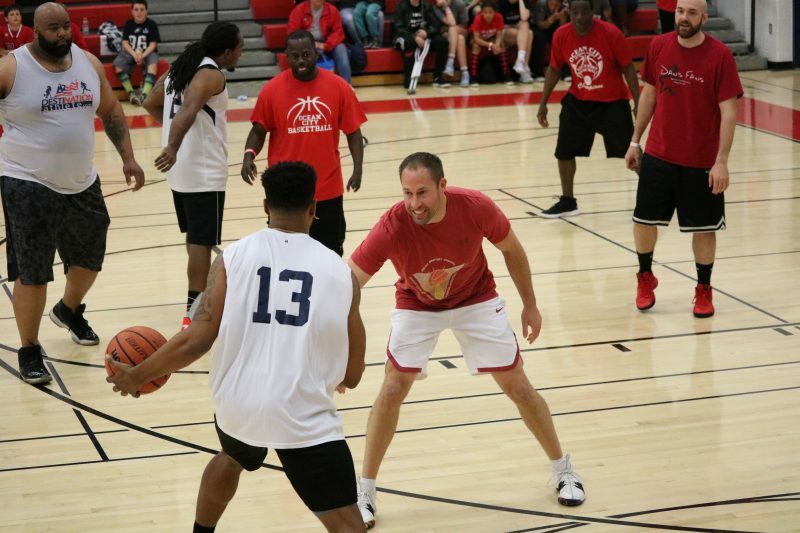 Members of the police department, City Council and the city clerk’s office tried their best to upend the professional athletes, but they should probably stick to their day jobs as professional basketball playing is not in their future. It was time for the final game of the evening, when the all-star team of Ocean City fifth graders battled to the final buzzer, sealing the victory for Ocean City. 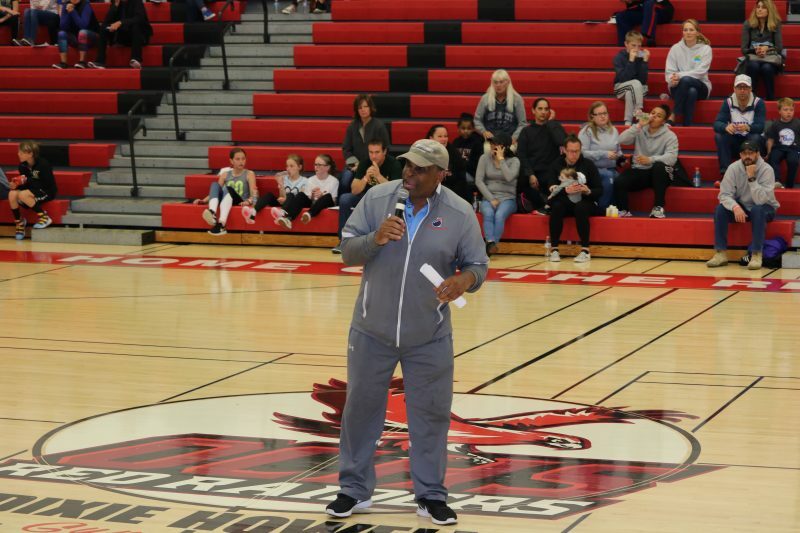 In what was a fun evening for all those involved, the larger message from Dreams for Kids was felt throughout the Ocean City High School gymnasium. A member of the Best Buddies Club dribbles against the all-stars on the way to the basket for a layup.